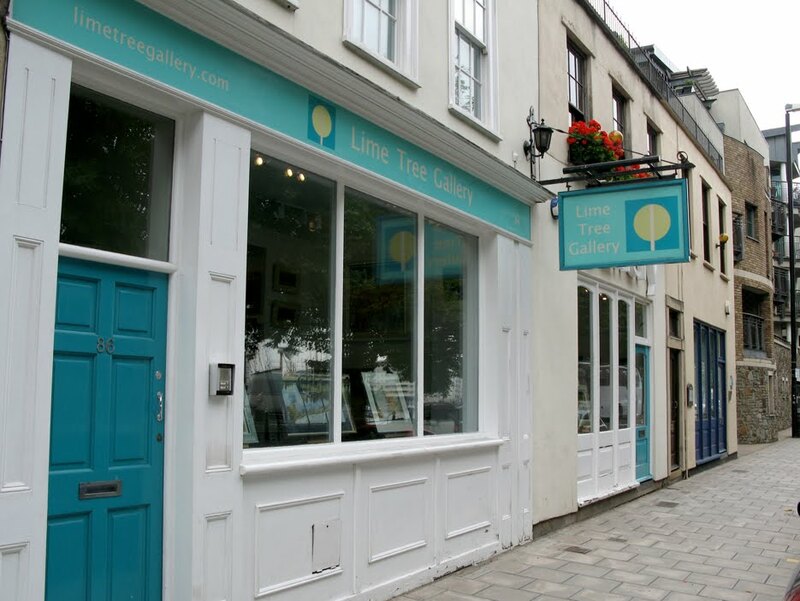 The Limetree (owned by Sue Dean and Stephen Edwards) specialises in contemporary Fine Art and Glass and holds regular exhibitions throughout the year. They have two galleries: one in the heart of Bristol city and the other in Long Melford, Suffolk. They have a particular love of contemporary Scottish artists, and always have a varied selection of their art on show. Ranging from traditional to modern, figurative to abstract, each exhibition is complemented by a selection of individual glass pieces from Britain and Sweden. Open from 10am to 5pm, Tuesday to Saturday, or by appointment. Resipole Studios is an award-winning fine art gallery with on-site artist studios, located on the West Coast of Scotland. The Resipole hosts an exciting annual programme of exhibitions and workshops of Scottish contemporary art that is both emerging and established. The gallery was launched in 2004 by Andrew Sinclair after a two-year renovation of an agricultural byre. Works on show at the Resipole .. The Morningside Gallery (owned by Eileadh Swan) specialises in contemporary art and works with emerging and established artists. Works on show at the Morningside Gallery from January 9th ..
Sold. ‘North Beach,Twilight. Isle of Iona III’. Mixed media on 6×6″ wood block. Rose Strang 2018. £90 (unframed). Sold. ‘North Beach,Twilight. Isle of Iona’. Mixed media on 6×6″ wood block. £90 (unframed). Rose Strang 2018. Sold. ‘North Beach, Twilight II. Isle of Iona’. Mixed media on 6×6″ wood block. £90(unframed) Rose Strang 2018. 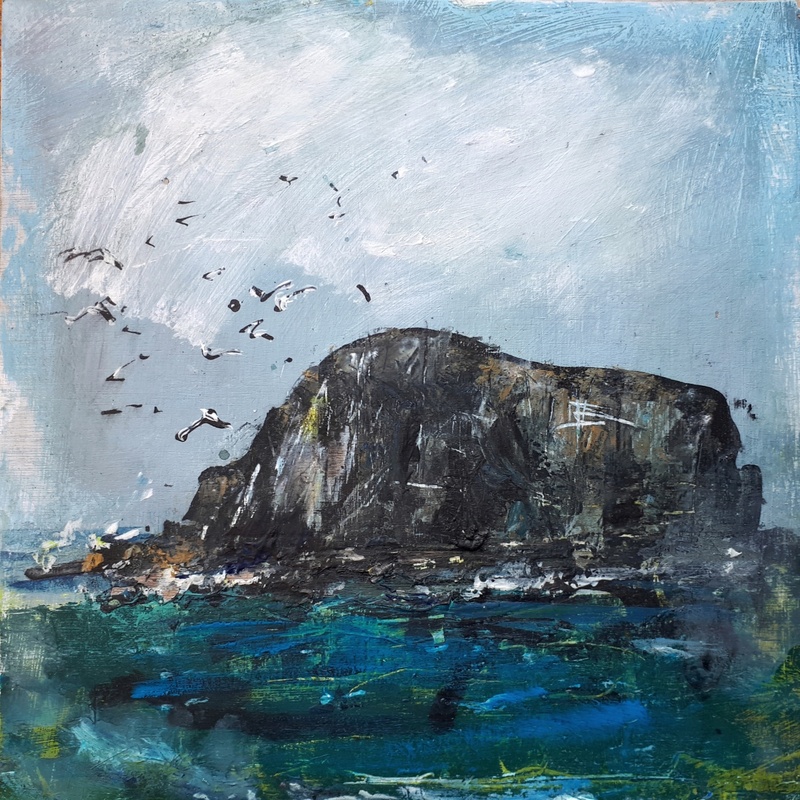 This entry was posted in Uncategorized and tagged landscape painting scotland, Paintings of Iona, rose strang paintings, scottish art, Scottish artists, Scottish landscape painting, west coast of scotland paintings on December 18, 2018 by rosestrang. ‘Road to Meikle Seggie’ – a response. 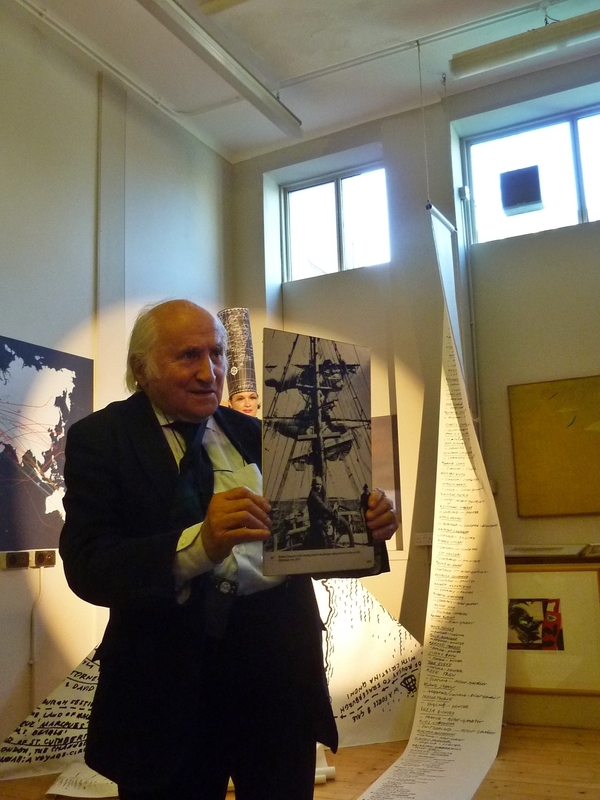 Last Saturday I attended a talk by Richard Demarco (Info -Richard Demarco CBE) at Summerhall in Edinburgh. This was a fairly informal pre-Christmas gathering, to explore themes of Richard Demarco’s work as a water-colourist over the decades. Richard invited us to respond on paper to the ideas discussed, but I had to leave before the end of the talk, so thought I’d post a response here ..
Richard Demarco (now in his late 80’s) has dedicated his life to promoting art as a means of dialogue and healing (with focus on Europe post WW2 – more info Here) so you might expect expect his paintings to encompass themes of war – or figurative human struggle perhaps. 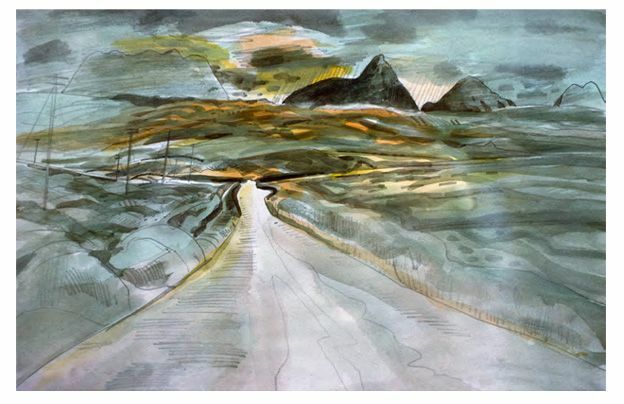 At first encounter though, his watercolours appear to be fairly traditional land and city-scapes; views (often iconic) mostly of landscapes across Scotland, from Edinburgh in the east, north across Fife then to the far west coast of Scotland. There’s a focus on changing light – not just how light plays on the subject (the concern of every artist who views the world around them) but particular focus on position of the sun, stars or moonlight; the time of day and the passing of time – the message is often reiterated with telegraph poles, signposts and pathways or roads, suggesting a journey shared by others. 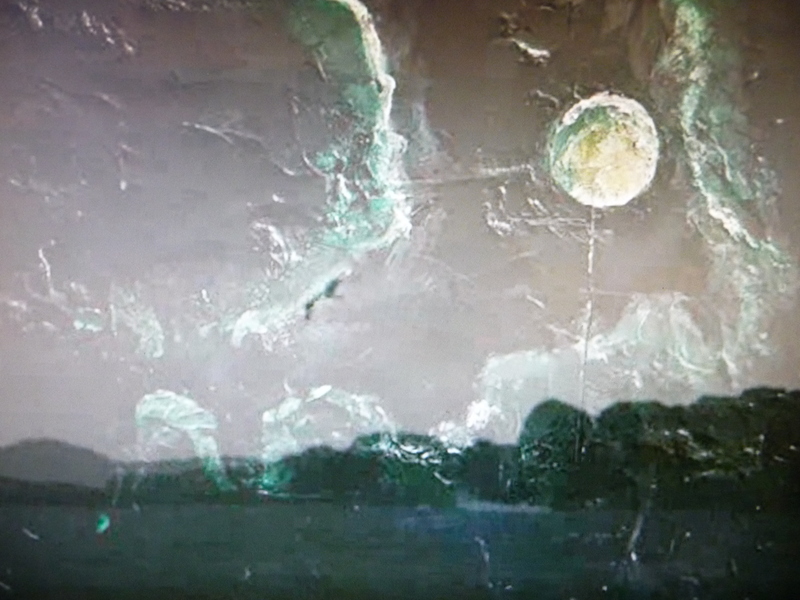 These paintings represent what Demarco describes as The Road to Meikle Seggie – they represent his own sense of place in time on that road, as well as the marks of those who came before. So these are not simply watercolour views – they describe a life-long journey, with meaningful connections. This could lead us down many intellectual avenues exploring art and time, but Richard Demarco’s work is about the immediacy of those themes – as they are felt and experienced in life, and this is reflected in his choice of watercolour as medium – it can’t be re-worked (in the same way as oil or acrylics for example) and this is similar to the immediacy of drawing – the viewer can see each mark as it’s been made – nothing is hidden. The first of many questions Richard explored on Saturday was – ‘Why do artists make their marks, and what moves them to do so? Anyone in a creative act – dancing, writing poetry, playing music, conjuring new ways of doing anything at all. We were asked to consider the thousands of touches it takes to create a work of visual art, or drawing, the number of movements to perfect a music piece, or a dance – untold thousands – risking failure at each touch. Richard humorously likened it to a tennis match or marathon in terms of effort involved, and of course I responded to this – how many marks do I make as a painter? Are those marks more or less neurotic doodlings?! Do they simply reflect the visual patterns of what I can see, or can I see or communicate something more profound? (He was probably referring to war, but a good quote nonetheless!). Richard asked us what thoughts these ideas, and his watercolours, inspired – as observers and as creative people, with the understanding that we are all creative – everyone (as Joseph Beuys famously said) is an artist. In which case , what might be the perfect creative act? Painting, music-making, dancing, singing, writing …? Richard suggested that it might actually be farming. Which seems at first a strange suggestion, given that large-scale farming (f not small-scale or organic) too often equals exploitation or destruction. 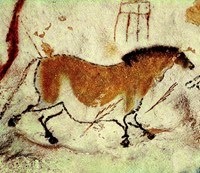 We were asked to consider the impact of tourism on land or city-scape, and in that context – the first known marks made by human beings – such as those in the caves of Lascaux. How did early humans experience landscape? Who were the first farmers or agriculturalists wishing to understand, live by, and perhaps revere, not simply exploit their surroundings? How did early hunter-gatherers engage with their environment? How might their imagination or intellect respond to, or attempt to control the unknown that surrounded and dictated every aspect of their existence? They are clearly markers of the movement of stars, sun and moon – representing precise, attentive observation of all that surrounds us. The stones are also mysterious and their presence is awe-inspiring – when there you feel you’re in the presence of something profound (not just a sort of scaled-up Swiss watch!). 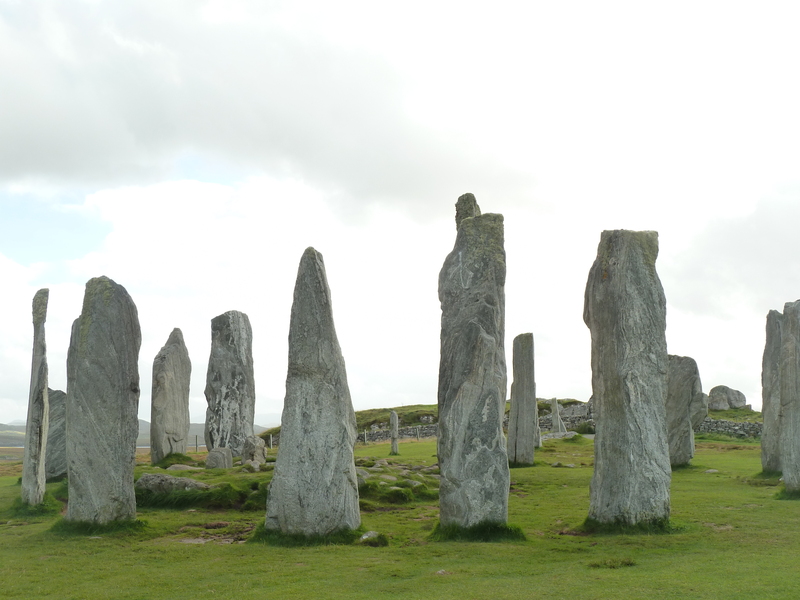 Callanish inspires a multitude of questions and imaginative responses about every aspect of our existence. It encourages us to consider the source of knowledge – whether from our minds, or from extrinsic sources. Richard suggested we’re limited by the echo-chamber of our own thoughts – re-fed to us via social-media, or, for example, ideas fed and repeated ad-infinitum through mainstream media. I can’t disagree with that! I was reminded of the numerous ways that landscape has profoundly affected or impacted my life. As I get older it feels ever more important to be present – to perceive what I see around me, as an artist, to the best of my ability. Maybe it’s becoming less about the marks made, since those become more instinctive – like a familiar dance that becomes, hopefully, more connected to the energy or emotion of what I see. 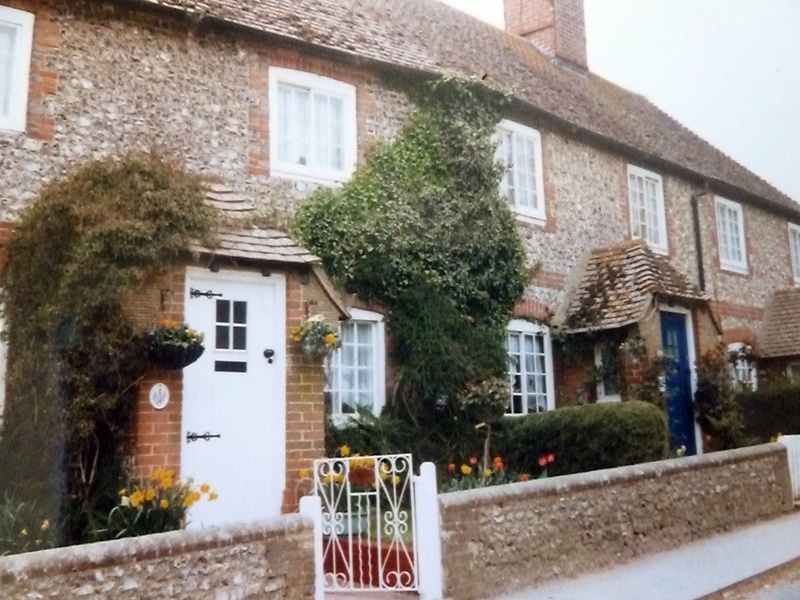 Now I’ve had time to mull over the ideas Richard discussed, I’m remembering the times (when I lived in Sussex for a few years) that I’d walk across the South Downs to a village called Fulking. The marks along the path left by ancient people fascinated me, because despite this being in one of the most populated regions of England, they were so few and transient – another decade or so and they’d probably be gone. We also saw very few people on that five-mile walk, but when we arrived at the tiny village of Fulking, the pub there (called the Shepherd and Dog) thronged with tourists seeking an authentic countrified lunch experience. I once climbed down a steep muddy bank through tangled bushes to find the source of the water, it was pure, drinkable and icy-cold though it was mid July. It surprised me that this place, so popular with tourists, had almost no marks of modern people either at the source of the spring, or on the path that led over the downs from the coast to Fulking. It was a chalk path, worn so deep in places that the sides were above five feet. Some months later I was visiting my grandfather, who’d grown up near Fulking in a village called Stanmer. I asked if he knew Fulking and he replied ‘I don’t know it very well personally, but I know someone who did. Your great grandfather was a sheep drover, he led sheep over the downs to Fulking’. The precise same path I’d walked many times. It thrilled me to realise I’d been drawn to (or just chanced on maybe?) the same path hundreds of years later. Sheep-droving explained why the path was worn so deep. That was about twenty years ago, but I believe it was integral to the way I explored landscape afterwards – one avenue of my own road to Meikle Seggie. My grandfather’s house, Stanmer Village. This entry was posted in Uncategorized on December 17, 2018 by rosestrang. Tell me, what signifies man? Where cometh he? What is his destiny? The waves murmur their eternal murmer. The stars blink, indifferent and cold and cruel. And a fool waits for his answer. This entry was posted in Uncategorized on December 9, 2018 by rosestrang.